The week preceding Easter is mostly coming to an end and yet, I still have so many chocolate ideas to share with you. I promise to post the second Molten chocolate recipe soon (for anyone impatiently waiting, hint hint MM 😉 !) Don’t we say that the best comes to those who know to wait? (in French we say that, smart eh?) tout arrive à qui sait attendre! Sunday, I am a host. That sounds ceremonial but in reality what it simply means is that I will have more than 2, 4, 6, 8 mouths to feed. You all remember that Sunday is Easter day and we are having a very informal lunch between friends. I love to be a host and prepare buffets, decorate tables, make little litlle nibbles everywhere, hidden in the house for us to eat. It is quite exciting. I actually have so many ideas for dishes I want to prepare that I know I should have 50 mouths to feed. But I have to stay grounded, en gardant les pieds (grands) sur terre (literally, with my feet (big) on the floor). I am alone in the kitchen and no matter how much energy I have or how organized I am, I already know that I have to remove a few things from my wish list. So I am running a chocolate test for dessert. Another of my rehearsals. So my test dessert is going to use white chocolate. Usually not my cup of tea but if you remember this recipe here, I have to admit that it is really growing more and more on me. And this dessert is the perfect example. I really appreciate when I start using a cookbook, and then keep going back to it for more, new recipes to try, all original and delightful because they bring surprises, not to mention that they turn successful each time. 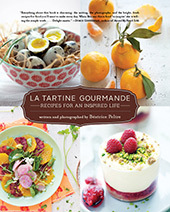 Tentations by Philippe Conticini is my current favorite cookbook. Every single recipe I have tried has worked just as I wanted, and this chocolate recipe is no exception. You would think that the recipes are just classics and they are, but always with a little twist that make them different. For the recipe I chose, I had to change the proportions because unless 1 serving was for super mini miniature people, I really think they were off. And we like our desserts, don’t we? Totally simple, using basic ingredients and gelatin. Did you know that in France, we used gelatin sheets, weighing about 2 g each and that before I arrived in the United States, I was fully foreign to the concept of gelatin powder. When I initially started using gelatin powder, I felt like a child using a new electrical appliance, who yet did not know how to plug it to make it work. It looks like a very tiny adjustement we will admit, but it really created a problem for me. I now of course master the gelatin powder technique quite well – yes yes, there is technique involved here -, but regularly ask my friends or family members to send me my gelatin sheets. Old mother Nature comes back. I prefer it. No question. What is the difference? To use a gelatin sheet (hard thin transparent sheet), you need to soak it first in cold water for a few mns. It becomes soft and you can then remove excess water and add it to warm liquids so that it melts. I just have to reckon that I love to play with it and see it disappear. Pouf! In no time, it is melted. Melt the white chocolate in a pot. Prepare the gelatin following the instructions on the package. Bring the temperature of the water to lukewarm and then while mixing, add it, with the gelatin to the melted chocolate. Mix well and let rest until it thickens. For the raspberries, simply mix them with the sugar and lime juice. To prepare your dessert, start by a layer of raspberry gelée. Slowly pour the chocolate. Go slow so that it does not fall into the raspberry gelée. Place in the fridge until it thickens. To decorate, mix the coconut and the sugar. Wet your basil leaves and dip them in the coconut/sugar mixture. 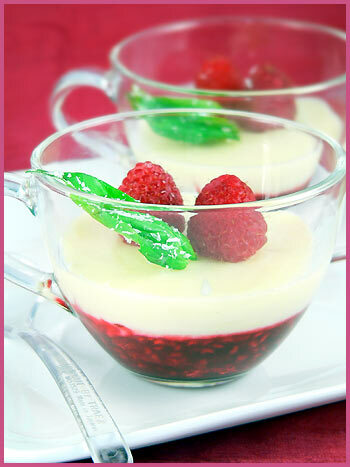 Decorate with the basil leaves and the raspberries. Tested and approved! Really nice! How I wish I could be at your Easter celebration! I will be having my own with my family. But I know what you mean … we start with so many ideas of things to make and then we also have to cut some out because there is no time/space for all the food! This dessert looks tremendous. I don’t use gelatin often but your description was very interesting … I will have to give this one a try! I think most pastry professionals use gelatin sheets – so much easier! And isn’t it fun to see them get soft and spongy? Your dessert is beautiful! Have a happy Easter! Absolutely beautiful dessert Bea!! And the quail egg photo before this…visually stunning! 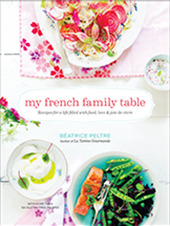 You certainly are taking fab photos of everything that goes onto your kitchen worktable. 🙂 I’m actually envious that you have the time to make so many wonderful recipes. Me? I’m just too exhausted when I get home from work, all I want to do is head for the liquor cabinet. Regarding your comment about the tiny mejiro eggs, they are really offwhite in color with just the palest hint of green. Really cute to look at. “Good things come to those who wait” is what we say. Cou cou! MMMmoi j’adore le chocolat blanc.. pour moi.. chocolat noir ou blanc mais pas au lait! Tu es vraiment en été! Also, if you pour the white chocolate over the back of the spoon, that’ll help it not mix into the bottom layer of raspberries. Still, you don’t need my advice; your dessert looks lovely…bonne Pacques! tu as de la chance car je rentre du marché avec deux barquettes de framboises, je vais donc pourvoir me donner à coeur joie dans la préparation d’un dessert car il est magnifique et la framboise se marie très bien avec le chocolat blanc. Beautiful dessert for the summer! And white chocolate can be very nice, though it can also be way too sweet. There is a delicious Estonian white chocolate with dried blueberries that I simply adore! I grew up using gelatine powder, and only recently began using sheets – which I definitely prefer now. Découvert grâce à AnneE de Station Gourmande lors de votre journée de partage, superbe idée cela dit ! Je vais devoir me remettre à l’anglais, car s’il y a bien de temps en temps un ou deux mots en français le reste du temps, c’est dans la langue de Shakespear ?? Tu as de superbes photos alléchantes, c’est un vrai bonheur de visiter ton blog. It’s COOL ! my Friends ! Wahou, that desert looks gorgeous. très belle photo pour un dessert qui m’est cher! Happy Easter for you and all your family!!! 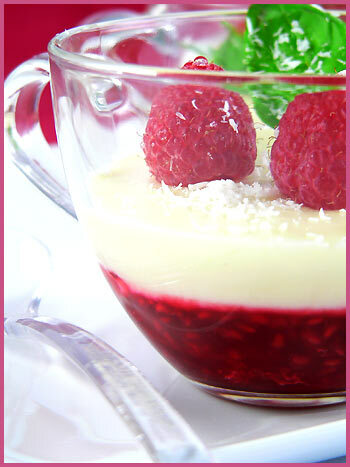 Totally gorgeous dessert – that rich red raspberry color – and white chocolate? Oh my. Why are you ALWAYS tempting me ??!!!!!!!!! Ca a l’air fabuleux ! Encore une fois on voudrait pouvoir manger directement la photo ! Dommage qu’il faille en passer par l’achat des ingrédients, la confection, etc… Tes photos me rendent toujours très impatiente ! Thanks all for your comments, and Happy Easter to you! I am serving it for my meal tomorrow, amongst other desserts believe it or not! This looks like such a simple yet elegant dessert. Gelatin sheets are much more versatile in cooking and baking. Fantastic Bea! beaux photos Béa! this is my first time on your site and i love that you share your recipes. joyeuses pâques! By the way merci pour le mail. Je pense que je vais me mettre au canson car j’en ai marre de repasser mes tissus en coton avant chaque photo! Fanny, merci! oui c’est vrai, c’est embêtant de repasser à chaque fois! je l’ai essayer et j’avoue que c’est trrrres bon!!!!! I agree the granulated gelatin is messy and time consuming. By the way, geat website!